Special thanks to my storm chase partner: Chris Moccio, for this photo. 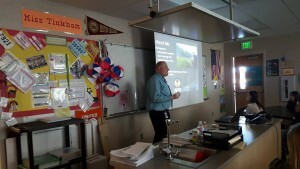 I had the great privilege of visiting Cimarron Middle School in Parker Colorado this past Thursday. Presenting to a class that was beginning a weather unit, I presented on the tools and trade of meteorology, how weather works including fronts, pressure and maps. 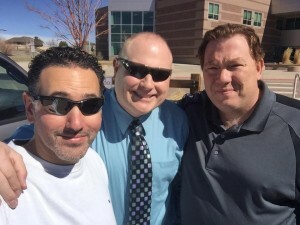 Additionally I talked about what it takes to become a storm chaser, how learning about weather and forecasting is important and even showed some pictures from this past month’s Storm Chaser Convention in Norman Oklahoma. I think the highlight for the class was the showcase of storm chase vehicle and tornado pictures that I put up and spoke about. A lot of schools are beginning to take a closer look at weather as it is now spring in Colorado and one of the most exciting times of year to observe and learn about weather in the state. I had an absolute blast doing it and although I was cut a bit short due to a fire drill… ugh. I still enjoyed it quite a bit and it seems like the class enjoyed it as well. Being my first public speaking engagement on meteorology I was joined by two good friends, my storm chase partner Chris Moccio (left) and very good friend Tom Santana (right.) Thanks for accompanying me guys!